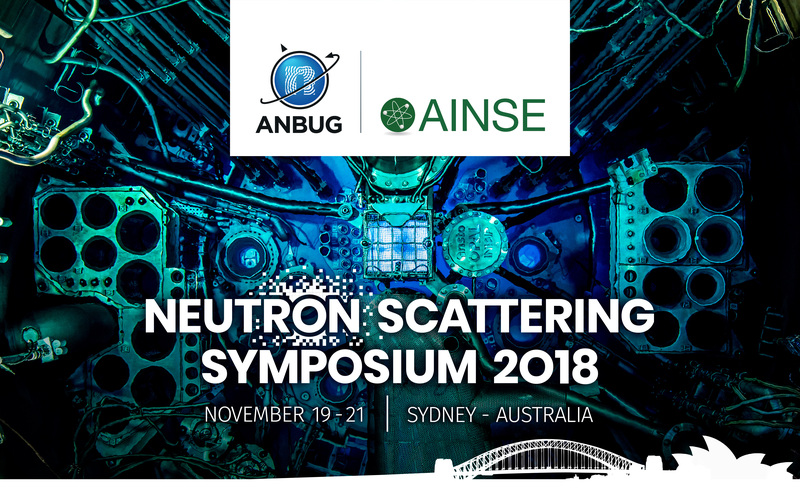 We are pleased to announce that the 2018 ANBUG-AINSE Neutron Scattering Symposium will be held on 19th – 21stNov 2018 at the AINSE conference centre, Lucas Heights, New South Wales, at the site of the ANSTO-operated OPAL research reactor near Sydney. The symposium is the biennial meeting of the neutron scattering community in Australia and New Zealand, and also welcomes the many international users of the Australian OPAL research reactor. Welcome to the AANSS 2018 website. This year, we have extended the programme to take place over three days. There are a number of sessions in various fields of science such as physics, chemistry, biology and engineering. There will also be a session dedicated to neutron techniques. This symposium is suitable for undergraduate and postgraduate students, postdoctoral researchers and scientists. Limited accommodation is available on site. We are keen to make this symposium available to as many people as possible, therefore student fees will be low. In addition, students presenting from AINSE member institutions requiring flights to Sydney are eligible to apply for an AINSE travel scholarship. AINSE funding is for flights only with a limited number of scholarships available. We are excited to provide this opportunity to share the latest progress in science and engineering in the neutron scattering world. We look forward to receiving your abstract and hearing about your research in November. Properties and functions of materials are determined by the structure and its evolution on every relevant time, length, field and energy scale. To understand these, neutrons play a critical role in providing important insights into the structure of polar functional materials as it responds to stimuli. In this talk, I will present a summary of recent progress in neutron scattering studies of piezoelectric, anti/ferroelectric and multiferroic materials, with a special focus on the investigation of neutron diffraction conducted under different fields (e.g. temperature, magnetic/electrical field and pressure). I will also report structurally dynamic behaviours of zeolites and metal-organic frameworks (MOFs) investigated by using time-of-flight inelastic neutron scattering and comment on the role neutrons play in gaining new insights into the properties of a broad range of key materials for practical application. I will then discuss overcoming challenges and technical difficulties to attain precision neutron analyses, and give my personal perspective as a user on the continuous development of instruments and methods needed for neutron scattering studies in the future. Interfaces between heterostructure components in nanoscale films play important roles in communicating low-dimensional phenomena and act as anchor points for the direct control and tunability of device performance. In this talk I will give an overview of our group’s recent investigations into the occurrence of magnetic interface phenomena in low-dimensional thin-film systems which have conceivable utility in future condensed-matter technologies. First, the magnetic interface quality of an FePt3 nano-magnet formed via ion-induced chemical disorder will be analysed . Here, neutron and electron measurements used in combination with density functional theory calculations reveal a rather counterintuitive result which could prove beneficial towards the development of ultra-high density magnetic recording devices. In a second study, the layer-averaged static magnetisation and macroscopic magneto-dynamic behaviours of a Co/Pd bilayer during hydrogen-gas cycling are analysed. To perform this characterisation, we first had to develop and commission an original sample environment which innovatively combines polarised neutron reflectometry and microwave spectroscopy . The Co/Pd interface is found to feature tailorable magnetic surface anisotropy in the presence of hydrogen gas – the mechanism of which could act as a safety switch in next-generation vehicles powered by hydrogen. Lanthanoid Single-Molecule Magnets (SMMs) are molecular materials that exhibit slow relaxation of the magnetization of molecular origin, thus making them promising targets for the development of spintronic devices and molecular memories. Since the electronic and magnetic properties of lanthanoid-based SMMs are strongly dependent on the characteristics of the electrostatic crystal field induced by the ligands on the lanthanoid ion, a thorough understanding of such magneto-structural correlations is crucial to develop molecules displaying SMM behavior at sufficiently high temperatures to warrant commercial applications. For this reason, ab initio calculations have proven to be valuable tools to elucidate the details of the electronic structure of SMMs and improve the understanding of their effect on magnetic properties and relaxation mechanisms. In this work, we have performed a set of ab initio calculations on the family of molecules [Ln(bpy)2(Cl4Cat)(Cl4CatH)(MeOH)] (Ln = Tb, Dy, Ho), employing the CASSCF/RASSI-SO method, and we have compared the predicted electronic and magnetic properties with the experimental data. These molecules, recently synthesized, are expected to display SMM behavior due of their structural similarity to other SMMs previously described in literature, with their low-lying energy spectrum determined with Inelastic Neutron Scattering (INS) for Ln = Tb, Ho. We show that there is a good agreement between computational and experimental results, thus confirming the validity of theoretical predictions of electronic and magnetic properties of lanthanoid-based SMMs. The lead halide perovskite materials have recently risen to prominence for remarkably high photovoltaic efficiencies in polycrystalline materials that are highly defected  Some of the reasons for this good defect tolerance are the very low exciton binding energy and consequent highly delocalized electrons and holes leading to high mobilities in these materials, coupled to low thermal conductance. Other recent work by our group has shown long lifetimes for hot carriers in a range of perovskites with organic lead iodide perovskites having the longest lifetimes . In order to explain those rather promising physical properties, a closer investigation of phonon dynamics is needed. Although ab initio simulations (DFT) can predict phonon dispersions to a reasonably accurate extent (comparison between different phonon modes) [2, 3], scaling their energies to actual phonon energies (particularly at high momenta near the zone edge) can be rather inaccurate. In order to obtain a detailed phonon dispersion to overcome the limits of the ab initio methods, inelastic neutron scattering techniques can be used (as they offer full Brillouin zone mapping and are suitable for large single crystal samples). The thermal triple axis spectrometer (TAS) on TAIPAN at OPAL reactor at ANSTO was used with the aim to map phonon dispersion of single crystal Methyl Ammonium Lead Halide Perovskites, CH3NH3PbBr3 and CH3NH3PbI3 . The alignment was performed so that we could scan through [h k l] and [ 0 k l] planes in reciprocal space for MAPbBr3 and MAPbI3 samples, respectively. Assuming the cubic space group, ABX3, for the MAPbBr3 sample, we were able to perform transverse and longitudinal scans along each high symmetry direction in the Brillouin zone (Г-X and Г-M) which would ensure the mapping of all phonon modes in the h k plane of the Brillouin zone. The full phonon dispersions that will be obtained with this method can be of great significance as by adding up to the already simulated data we will be able to have a deeper insight into the undergoing physics that is responsible for the previously observed properties (such as significantly extended hot carrier lifetimes) where phonon dynamics will play a significant role. There has been renewed interest in solid state sodium-ion batteries (SIBs) as a safe, sustainable and cost-effective alternative system for large scale energy storage applications. This, in turn, has motivated many studies on the development of materials that facilitate high ionic conductivity over multiple charge-discharge cycles. Layered sodium manganates and the NASICON family of compounds are promising candidate sodium electrode and solid-state electrolyte materials respectively. In both cases, it has been shown that the overall performance of these materials for their respective functions is significantly improved through structural modifications, including by hydration or chemical doping. [2-8] However, the characterisation of these materials are typically limited to techniques which only offer a macroscopic picture, such as electrochemical impedance spectroscopy. As such, direct links between conductivity and structure, particularly with reference to the effect of chemical doping on the microscopic properties of materials are rarely investigated. We have selected candidate materials which have been shown to be amongst the best performing for their purpose and use high resolution diffraction data to solve their average structure. In parallel, we use quasielastic neutron scattering spectroscopy to gain insight into the diffusion mechanisms at an atomic level. We consequently aim to form a fuller picture of the effects that structural modifications have on the ionic conductivity and hence overall performance of these materials. Palomares, V., et al., Na-ion batteries, recent advances and present challenges to become low cost energy storage systems. Energy & Environmental Science, 2012. 5(3): p. 5884-5901. Han, M.H., et al., High-Performance P2-Phase Na2/3Mn0.8Fe0.1Ti0.1O2 Cathode Material for Ambient-Temperature Sodium-Ion Batteries. Chemistry of Materials, 2016. 28(1): p. 106-116. Han, M.H., et al., Moisture exposed layered oxide electrodes as Na-ion battery cathodes. Journal of Materials Chemistry A, 2016. 4(48): p. 18963-18975. Jolley, A.G., et al., Improving the ionic conductivity of NASICON through aliovalent cation substitution of Na3Zr2Si2PO12. Ionics, 2015. 21(11): p. 3031-3038. Khakpour, Z., Influence of M: Ce4+, Gd3+ and Yb3+ substituted Na3+xZr2-xMxSi2PO12 solid NASICON electrolytes on sintering, microstructure and conductivity. Electrochimica Acta, 2016. 196(Supplement C): p. 337-347. Samiee, M., et al., Divalent-doped Na3Zr2Si2PO12 natrium superionic conductor: Improving the ionic conductivity via simultaneously optimizing the phase and chemistry of the primary and secondary phases. Journal of Power Sources, 2017. 347: p. 229-237. Song, S., et al., A Na(+) Superionic Conductor for Room-Temperature Sodium Batteries. Scientific Reports, 2016. 6: p. 32330. Nam, K.W., et al., Critical Role of Crystal Water for a Layered Cathode Material in Sodium Ion Batteries. Chemistry of Materials, 2015. 27(10): p. 3721-3725. Many advanced materials, such as thermoelectrics, phosphors for light emitting diodes, electrodes and solid electrolytes for batteries, etc. are difficult objects for stand-alone crystal structural analysis based on diffraction techniques due to intrinsic high disorder of one of the sublattices. Traditional diffraction data analysis based on atom-centric models with explicitly declared atomic positions is often unstable or unable to fully capture all the details due to correlations between variables. Additional difficulties arise from the limitations of X-ray diffraction in locating light elements and distinguishing elements with close atomic numbers (e.g. Mn/Ni/Ci). Combining X-rays with neutrons and traditional diffraction data analysis with other approaches, such as Maximum Entropy Method, and atomistic modelling and theoretical symmetry analysis allows to paint a more complete picture. I will illustrate the point using our recent studies of several such structurally complex systems, such as NASICON and P2-types and phosphor polyanion frameworks. All of them have been studies for decades and yet complementing experiment with theory and modelling revealed new features which help understand and improve properties. Ionic liquids (ILs) are molten salts at room temperature. ILs possess remarkable physio-chemical properties including high solubility of compounds that are otherwise insoluble in molecular solvents. One important application is the dissolution of lignin during pretreatment of biomass. Previous studies have shown low-cost and biocompatible ILs containing cholinium as the cation and an amino acid as the anion. Cholinium lysinate (ChLys) demonstrates the highest potential as a lignin processing solvent, with low viscosity and high selectivity at ambient temperature. The treatment is effective with up to 20% water. Time-of-flight neutron diffraction directly measures the structure of ILs and its mixtures. Using isotopic substitution of hydrogen by deuterium, we simultaneously fit a series of diffraction patterns into a simulation method called Empirical Potential Structure Refinement (EPSR). This method experimentally refines a simulation box to describe liquid structure at the nano- and atomic scale. Our study investigates the structure of amino-acid ILs, with and without the presence of water. We use guaiacol (2-methoxy-phenol) as a model aromatic residue of lignin to identify key solvent-solute interactions. Bio-based ILs can be nanostructured. Results show pronounced nanostructure of ChLys before and after the addition of water. The added water molecules form domains at the nanoscale, without disrupting the amphiphilic nanostructure of ILs. Based on key intermolecular interactions, we present a framework for the design of IL structure to minimize competition and to enhance driving forces for aromatic extraction. Many different electrolytes with perovskite and fluorite-type structures have been extensively explored and characterised. Minimal focus has been given to potential Bixbyite-type electrolytes. A ternary copper antimony oxide previously referred to as Cu9Sb4O19 with an unresolved crystal structure looked like a promising candidate to study. This was synthesised using classic solid state techniques under high temperature and oxygen pressure. Refinement of lab X-ray diffraction data strongly indicated that this material was isostructural with Cu3TeO6 with a curiously large degree of oxygen vacancies. Refinement of neutron diffraction patterns revealed the system was much more complicated than first anticipated, confirming the under occupancy of oxygen and revealing the mixed occupation of Cu2+/Sb5+ sites in the cationic sub-lattice. The final composition can be refined to Cu3−xSbO5.5+3x/2 X-ray absorption experiments confirmed the local coordination significantly differs from Cu3TeO6 complimenting the diffraction data. This is an interesting material in a good position for many potential applications like; oxygen membranes, sensors or as a cathode/electrolyte material warranting further investigation. It is often assumed that a hydrophobic drug will be entrapped in the hydrophobic environment of a micelle. Little attention is usually drawn to the actual location of the drug and the effect of the drug on properties. In this publication, we show how the chosen drug curcumin is not only unexpectedly located in the shell of the micelle, but that the accumulation in the hydrophilic block can lead to changes in morphology during self-assembly. A block copolymer poly(1-O-methacryloyl -β-D-fructopyranose)-b-poly(methyl methacrylate), Poly(1-O-MAFru)36-b-PMMA192, was loaded with different amounts of curcumin. The resulting self-assembled nanoparticles were analyzed using TEM, SAXS, and SANS. Initial microscopy evidence revealed that the presence of the drug induces morphology changes from cylindrical micelles (no drug) to polymersomes, which decreased in size with increasing amount of drug (Figure 1). SAXS and SANS analysis, supported by fluorescence studies, revealed that the drug is interacting with the glycopolymer block. The drug did not only influence the shape of the drug carrier, but also the level of hydration of the shell. Increasing the amount of drug dehydrated the nanoparticle shell, which coincided with a lower nanoparticle uptake by MCF-7 breast cancer cells and non-cancerous Raw-264.7 cells. As a result, we showed that the drug can influence the behaviour of the nanoparticle in terms of shape and shell hydration, which could influence the performance in a biological setting (Figure 1). Although the depicted scenario may not apply to every drug carrier, it is worth evaluation if the drug will interfere in unexpected ways, for example, when the drug locates on the surface and affects the internal structure of the nanocarrier. Analysis of hydrogen-containing molecules via neutron scattering analyses often benefits from the substitution of hydrogen with deuterium atoms, since hydrogen (protium) and deuterium have different scattering length densities (SLDs). Selective replacement of protium for deuterium in multi-component systems allows the scattering from individual components to be observed in isolation. For this reason, neutron scattering facilities such as the European Spallation Source (ESS) are invested in furthering techniques for producing deuterated molecules. Current methodologies fall broadly under the categories of ‘chemical’ – using H/D exchange reactions, or deuterated reagents, to exchange or install deuterons – or ‘biological’ – growing organisms in D2O, often with a deuterated carbon source, followed by extraction and purification of the molecules of interest. The chemical deuteration laboratory at ESS is aiming to establish a combined chemical-biochemical approach to deuterated molecules exploiting enzyme catalysis. Enzyme catalysis is advantageous because it is safer than and operates under milder conditions than conventional chemical synthesis and because it shows excellent chemo-, regio- and enantioselectivity, greatly increasing efficiency. We have successfully applied this approach to the synthesis of enantiopure deuterated D- and L-lactic acid-d4; current work focuses on applying this method to tail-deuterated mixed-acyl phospholipids such as 1-palmitoyl-2-oleoyl-sn-glycerol-3-phosphocholine (POPC). Recent results will be presented. Hydrous clay minerals (smectites) have complex interactions with water that both define them as separate from other layer silicates (e.g., micas) and also impart their unique suitability as environmental barriers. Cation hydration, surface adsorption and matrix suction are processes by which water is explained to interact with clay mineral surfaces. The hydration energies of cations held within the interlayer space of montmorillonite have long been viewed as key to clay mineral hydration. Many experiments have shown that the charge and hydration energy of the interlayer cation imparts differences in the way the clay mineral hydrates, orders and interacts with its surroundings. Water adsorption to the surfaces of clay minerals are also important: halloysite contains interlayer water without the presence of interlayer cations; instead the residual charge at the gibbsite-like surface is thought to enable fairly strong hydrogen bonding. As fine-grained materials, the structure of the pore-network within a particle of clay mineral (containing perhaps many thousands of individual layers) can be shown to control water uptake and release. During either of these processes, the pore-structure can change in smectites, making complete characterization difficult. Various approaches can be used to study the above processes and this paper serves to highlight applications of neutron scattering, particularly elastic fixed window (EFW) and quasi-elastic neutron scattering (QENS) methods to study the mobility of water within bulk pores, the interlayer space, and surrounding the interlayer cation of montmorillonite. A simple experiment will be detailed that enables full quantification of water in various hydration states within a well-characterized montmorillonite sample, and further how this can be related to applied engineering problems in determining the unfrozen water content of a bentonite (a smectite enriched rock) used as an environmental barrier for site remediation work by the Australian Antarctic Division at Casey Station, Antarctica. Some of the most striking images from the New Horizons fly-by of Pluto were of the towering mountains surrounded by seemingly flowing glacial terrain . The explanation for this terrain has its basis in crystallography, where at 44 K the strength of the hydrogen bond endows water ice with the resilience to build such mountains, while the rotational disorder in the solid structures of methane  and nitrogen  allow these materials to flow plastically even at 44K. These interpretations have been strengthened by the spectral observations that correlate these materials to the respective terrains . In order to undertake accurate modelling of the geological features on Pluto the physical properties of the constituent materials must be well constrained. Although water-ice has been the subject of intensive laboratory studies, the same cannot be said of methane and nitrogen. The thermal expansions of these materials have been investigated , but only to a lowest temperature of 40 K and using techniques which were largely insensitive to, in particular, the hydrogen positions within methane. Thus, the aim of the experiments reported here is to investigate the structures and determine the thermal expansion of methane and nitrogen over temperatures relevant to Plutonian processes using neutron diffraction. References: . Moore, J.M., et al., Science, 2016. 351(6279): p. 1284-1293. . Press, W., Journal of Chemical Physics, 1972. 56: p. 2597. . Press, W., B. Janik, and H. Grimm, Zeitschrift für Physik B Condensed Matter, 1982. 49(1): p. 9-16. . Grundy, W., et al., Science, 2016. 351(6279): p. aad9189. . Heberlein, D., E. Adams, and T. Scott, Journal of Low Temperature Physics, 1970. 2(3): p. 449-463. The physical extraction of fossilised remains from rocks enables quantitative physiological investigation of bonedimensions,volume, and porosity, however leads to the destruction of valuable contextual information and soft-tissue remains within the matrix. Conventional and synchrotron-based X-ray computed tomography (XCT) have been utilised for many years as critical tools in uncovering valuable 3-D internal and surface renderings of scientifically important fossils, however poor contrast and X-ray penetration often prevents thorough tomographic analysis. DINGO, Australia’s first and only neutron micro-computed tomography (nCT) instrument, located at the OPAL nuclear research reactor, is being used to obtain unpreceded reconstructions of extraordinary fossilised anatomical features not visible with conventional imaging techniques. This presentation will outline the physical capabilities of DINGO, the limitations and results to-date in the field of palaeontology. Drawing upon specimens scanned from across Australia, North America, New Zealand, and China, this presentation will demonstrate the complementarity of nCT to classic XCT methods for certain geological formations and fossil localities. nCT has yielded unpreceded contrast and detailed-reconstructions of fossilised soft tissue in a Jurassic cynodont. The stomach contents and digestive function of herbivourous and carnivorous dinosaurs, and a Cretaceous Australian crocodilian have been revealed, providing insights into ancient environments and food chains. In this way, a new species of Australian dinosaur has been discovered. We have been investigating the magnetic interactions between lanthanide ions in a series of isostructural asymmetric dimetallic complexes of dysprosium(III), erbium(III) and ytterbium(III). Using a barrage of techniques including electron paramagnetic resonance spectroscopy, inelastic neutron scattering, and complete active space self-consistent field calculations, we have determined the highly anisotropic magnetic coupling matrix within the low-lying manifold spanned by the ground Kramers doublets of each ion. In all cases the magnetic interaction is not solely dipolar in origin, indicating a measurable superexchange component. We find a unique orientation for the magnetic interaction matrix, corresponding to a common elongated oxygen bridge for the erbium(III) and ytterbium(III) analogues, suggesting a microscopic physical connection to the magnetic superexchange. These results are vital for building and validating model microscopic Hamiltonians to understand the origins of magnetic interactions between lanthanides and how they may be controlled with chemistry. E. Moreno Pineda, N. F. Chilton, R. Marx, M. Dörfel, D. O. Sells, P. Neugebauer, S.-D. Jiang, D. Collison, J. van Slageren, E. J. L. McInnes and R. E. P. Winpenny, Nature Commun., 2014, 5, 5243. M. J. Giansiracusa, E. Moreno-Pineda, R. Hussain, R. Marx, M. Martínez Prada, P. Neugebauer, S. Al-Badran, D. Collison, F. Tuna, J. van Slageren, S. Carretta, T. Guidi, E. J. L. McInnes, R. E. P. Winpenny and N. F. Chilton, J. Am. Chem. Soc., 2018, 140, 2504–2513. Titanium oxides has drawn extensive attention as functional electronic materials in the past few years, due to their unique layered structure and physical properties. Sub-stoichiometric titania are particularly interesting non-toxic materials for thermoelectric applications because of their high electrical conductivity with possible low phonon thermal conductivities originated from phonon scatterings at ordered defect planes. Hereby, layered sub-stoichiometric Ti2O3 material has been successfully fabricated by densifications of the ball-milled precursors with spark plasma sinterings. The experiments were performed on densified Ti2O3 samples with 0.5, 3 and 10 h ball-milling times to compare the changes in PDOS. The application of high-energy ball milling could significantly decrease the grain size in the SPS-densified bulk sample, and thus affect the phonon behaviours. The XRD results showed with the increasing of ball milling hours, the percentage of Ti3O5 increased while Ti2O3 is still the main phase. Measurements of phonon density-of-states (PDOS) were performed with the PELICAN time-of-flight neutron spectrometer in the energy-gain mode at ANSTO, at 200, 300, 500 and 650 K, respectively. The overall shapes of the GDOS are very similar across the three samples, with three peaks located at around 20, 40, and 60 meV and matched well with the calculated PDOS of Ti2O3, indicating the dominate phase for three samples are still Ti2O3. With the temperature increasing, the peak intensity at around ~20 meV increased, however, the red-shifts and intensity decreases were observed at the 40 and 60 meV phonon DOS peaks (as indication of anharmonic effects). This suggested that the acoustic phonons response differently to temperature increase compared to optical phonons. The intensities at between 50 to 60 meV increases for the 10H spectrum, compared to the other two. This is probably because of the excitation of the phonon states in Ti3O5, as the increased Ti3O5 percentage in 10H sample. Our results suggested the measurement matched well with the theoretical study, which indicates the structural changes could have played significant roles in determining the phononic structure of sub-stoichiometric Ti2O3 based material. Solar cell technology is an active area of research with the quest to improve the efficiency of solar cells to above the current value of 44% . Hot carrier solar cells are particular types of cells which may enable higher efficiencies to be obtained. However, these are only feasible where there is a sufficiently large band gap in the phonon dispersion of the bulk material to minimise energy loss to from thermalisation, thus keeping the electrons ‘hot’. Binary compounds with a large mass difference between the two constituent atoms, and high level of crystal symmetry such as titanium hydride, can have such a gap in their phonon dispersion. Titanium hydride is an interesting photovoltaic material with a broad range of properties, which vary depending on the proportion of hydride present. Theoretical studies show TiH2 has a phonon band gap of 95 meV in the bulk phase , however, there is little experimental data to confirm this. TiH1.65 has been measured using X-ray powder diffraction and inelastic neutron scattering whereby it was found that this sample had a phonon band gap of 65 meV . We present here further X-ray powder diffraction and ineleastic neutron scattering data on powder samples of TiH2 and TiH1.5 whereby we show the correlation of phonon band gap with hydrogen content. We present time-of-flight neutron spectroscopy data from PELICAN on α-Fe2O3 nanorods with an average length of 300 ± 100 nm and diameter of 60 ± 10 nm. A strong quasi-elastic neutron signal is associated with absorbed water on the nanoparticle powder, which can be removed through heat treatment. After suppressing the QENS signal, it is possible to observe weak spin wave excitations originating from the antiferromagnetic structure of the α-Fe2O3 nanocrystals. The excitations are directly compared with measurements conducted on larger microscale α-Fe2O3 particles at various temperatures to highlight differences in mode intensity and width. The interchanged spectral intensities in the nanorod are a consequence of a suppressed spin orientation, and this is also evident in the neutron diffraction which demonstates that the weak ferromagnetic phase survives to 1.5 K. The main magnon features are similar in bulk and nanoforms and can be explained using a model Hamiltonian considering interactions up to fourth nearest-neighbors. Complementary scanning transmission electron microscopy data is presented in order to clarify the atomic-scale structure and morphology of the rods. Finally, the implications are discussed for technological devices based on magnonic transmission at surfaces and through nanowires . Human carbonic anhydrase IX (CA IX) expression is activated by hypoxic condition in aggressive, metastatic tumors. Cancer patietns positive for CA IX have generally a poor prognosis. CA IX has emerged as an important cancer target, but efforts to develop isoform selective inhibitors are complicated by the presence of 14 other CA isoforms that share high sequence and structural similarity. This leads to off-target inhibitor binding and side effects. Recent studies showed that saccharin (SAC) already shows some isoform discrimination, and that conjugating SAC to a glucose molecule (Saccharin-Glucose Conjugate, SGC) further improves the Ki against CA IX by 2-fold. Ligand binding to proteins are mediated through numerous interactions, including: H-bonding directly and/or through intervening waters, electrostatic interactions with charged or polar amino acid side chains, metal coordination, energetic changes through water displacement, aromatic ring stacking, or other hydrophobic interactions. As neutrons scatter strongly from atomic nuclei of light atoms 1H (Hydrogen), and its isotope 2H (Deuterium), it is possible to use neutron protein crystallography (NPX) to “see” the light atoms and any interactions they are involved with. (e.g. H-bonds). We used joint X-ray and neutron crystallography methods to determine the crystal structures of a CA IX mimic alone and in complex with SAC and SGC, respectively. Our analyses reveal the molecular details of solvent displacement upon ligand binding, the H-bonding between the ligands and the proteins, involvement of water-mediated H-bonds, and the remodeling of H-bonds to accommodate ligand binding. The structures and analysis also provide an explanation for the observed CA isoform selectivity of the ligand under study. Correctly forming disulphide bonds is critical to the folding of a wide variety of proteins. Bacterial virulence factors are one class of proteins containing disulfide bonds, thus, an approach to disarm virulent bacterial might involve shutting down the machinery involved in the formation of disulfide bonds. The suppressor of copper sensitivity (Scs) proteins form part of the disulfide bond forming machinery in bacteria, and it is hoped that determining the structure of molecules such as this may lead to the development of new classes of antibiotics. There are four Scs proteins (ScsA, B, C and D) present in numerous Gram-negative bacteria, and few have been structurally characterised. In this work, we have created cysteine variants of PmScsC and PmScsB to produce a stable complex and using small-angle X-ray and neutron scattering with contrast variation, we have determined the low-resolution structure of the PmScsC–PmScsB complex. To date, epidemiological studies, animal studies and clinical trials have indicated the potential of non-steroidal anti-inflammatory drugs (NSAIDs) for the chemoprevention of colorectal cancer (CRC) . Unfortunately, the use of NSAIDs for CRC chemoprevention is significantly limited due to the severe gastrointestinal (GI) side effects that have been associated with their long term use . It is hypothesised that the coordination of NSAIDs to bismuth, a heavy metal with proven gastrointestinal sparing properties , may allow the use of NSAIDs as chemopreventives for CRC while also combating their associated GI side effects. The present study investigates the interactions of bismuth-coordinated NSAIDs (BiNSAIDs) with eukaryotic membrane mimics with the aim of establishing the possible uptake mechanisms of these compounds. This knowledge will be extended by investigating the behaviour of BiNSAIDs in more complex systems, including CRC cells and a CRC animal model. QCM-D studies involving biological membrane mimics composed of POPC or POPC/cholesterol demonstrated that BiNSAIDs and their parent NSAIDs interact with biological membranes . Neutron reflectometry was also used to study the membrane interactions of BiNSAIDs and provided further evidence of the membrane interactions of BiNSAIDs, suggesting that passive diffusion is a likely method of uptake of these compounds . These strength of these membrane interactions was an indicator of BiNSAID cytotoxicity against CRC cells.3 A CRC animal study has recently been completed with aspirin, which has promising preliminary results. In conclusion, the aforementioned studies continue to highlight the potential of BiNSAIDs as candidates for further investigations into their potential for the chemoprevention of CRC. Plant cell walls (PCWs) are extremely complex structures in which cellulose microfibrils are hierarchically assembled and embedded in a multi-component matrix. While the cellulose microfibrils represent the basic building unit providing mechanical strength , the matrix components are able to tune the properties of each specific tissue [2-3], increasing the flexibility or limiting the transport of moisture, for instance. The synthesis of cellulose hydrogels by means of bacterial fermentation is an efficient approach to mimic the cell wall biosynthesis process and investigate the interactions established between cellulose and matrix polysaccharides by incorporating the latter into the culture medium. We have characterised cellulose hydrogels and their composites with PCW polysaccharides by means of SANS and SAXS, combined with complementary techniques such as X-ray diffraction, spectroscopy and microscopy. Furthermore, the production of partially deuterated cellulose hydrogels by using a deuterated glucose-based feedstock is presented as a strategy to enhance the neutron scattering length density contrast . The application of a multi-technique characterisation approach enabled elucidation of the complex hierarchical architecture of cellulose hydrogels and led to the development of a multi-scale model based on core-shell structures [4-8]. The model describes the multi-phase structure of cellulose microfibrils and ribbons, as well as the essential role of water at the different structural levels. In addition, USANS experiments are presented as a promising method to characterise the structure of native cellulose in the longitudinal direction, providing information on the microfibril length and ribbon twisting periodicity. PCW polysaccharides such as xyloglucan, arabinoxylan, mixed linkage glucans and pectins during cellulose synthesis have a distinct structural role and interaction mechanism with cellulose (interfering with the crystallisation process and strongly interacting with the cellulose microfibrils, or establishing interactions at the ribbons’ surface level). These results highlight the ability of small angle scattering techniques to provide valuable insights on cellulose biosynthesis and interactions with PCW polysaccharides. For more than 10 years, time-of-flight detectors at pulsed neutron sources have been capable of providing high-resolution images of strain fields through Bragg-edge analysis . With a geometry akin to a traditional radiograph, these images represent a projection of the full 3D tensor strain distribution to a scalar field. This poses a rich tomography problem based on a generalised version of the Radon transform known as the Longitudinal Ray Transform (LRT). The solution to this Bragg-edge strain tomography problem promises a new approach by which the full triaxial elastic strain (and hence stress) distribution could be observed within crystalline solids over the scale of centimetres. This presentation will provide an overview of Bragg-edge imaging and strain measurement before outlining recent work by the Authors focused on solving the associated tomography problem. The central issue that rendered the problem ill-posed will be discussed before introducing a range of approaches based on equilibrium constraints. A two dimensional experimental demonstration based on data from the RADEN energy-resolved imaging instrument (at J-PARC in Japan) will be presented with comparisons to detailed constant-wavelength strain scans from the KOWARI diffractometer (ANSTO). The generalisation of this approach to three-dimensions will also be discussed. Tremsin et al. “High-resolution strain mapping through time-of-flight neutron transmission diffraction with a microchannel plate neutron counting detector”, Strain, v48 pp296-305, 2012. Additive manufacturing is an exciting new approach to produce components that are not manufacturable using traditional methods. Coupled with its short CAD-to-product time, this method had been gaining significant attention. In particular, the application of Selected Laser Melting, which can process metals, is gaining popularity in application on aerospace components. Due to the numerous rapid thermal cycling in the melting process, strong residual stresses develop within the component being built, which leads to deformation and cracking. Neutron diffraction has sufficient penetration and measurement resolution to map the residual stresses variations within the component. Furthermore, the dimensional accuracy of the produced components is particularly difficult to measure due to the complex geometry. For example, the application of topology optimisation for weight reduction leads to a more organic shape as well as internal cavities but the component becomes more sensitive to geometric variations. Neutron CT is able to capture the geometry, particularly of internal cavities, as well as possible defects present. The combination of these two neutron measurement techniques provide a strong basis for improving the understanding of the SLM process and aid in the maturing of this process towards serial production. Intermetallic alloys such as aluminides of titanium, nickel and iron exhibit an attractive combination of physical and mechanical properties such as high melting point, low density, high strength, good oxidation, and creep resistance, due to their strong internal order and mixed bonding. However, the properties of these materials are often obtained at a cost in terms of ease of manufacturing. In recent years the WAAM process has been successfully applied to in-situ produce TiAl and Fe3Al intermetallic components with designed chemical compositions. One of the major concern is residual stresses (RS) distribution in the WAAM fabricated components as it not only influences the part tolerance but also cause premature failure. The neutron diffraction technique has been recoganised as the most precise and reliable method of mapping sub-surface RS in components for both academic and industrial-economic relevance. Considering the outstanding capability of obtaining RS non-destructively deep within the interior of components, our study utilised neutron diffraction technique to conduct RS measurement by the angular scanning instrument KOWARI. Furthermore, an averaging method has been developed for the WAAM multi-bead buildup intermetallic alloys with large grain size. With the averaging method applied during experimental setup and data processing, reasonable residual stress results have been obtained from the acquired neutron diffraction data. The interfaces between polymers and inorganic materials are of pivotal academic and industrial interest. An example of this is the interface in nanocomposites, a class of materials composed of polymers (matrix) and inorganic nanoscale powders (fillers). In general, the performance of a nanocomposite strongly depends not only on the physical properties of the matrix but also on the interaction between the matrix and the filler material. It is noteworthy that the physical response of a composite can be modulated via the interactions resulting from the attachment/detachment of polymers to the fillers. This means that an understanding of the interfaces between the polymer matrix and inorganic fillers is essential to construct highly functionalized nanocomposites. A specific example is tire materials; because the rubber used for tires consists mainly of a polymer elastomer matrix and carbon/silica fillers, an understanding of the interface between the polymer and the filler is important for improving quality. In the case of a carbon filler, a nanometer-thick layer called the bound rubber layer (BRL), is typically formed on the carbon surface and is resistant to be dissolved even in a good solvent. In theory, the interactions between polymers and carbon material surfaces restrict molecular motion, which correlates with increased resistance to mechanical deformation compared to free polymers that are located away from carbon material surfaces. Significant effort has been made in industry to manufacture high-performance tires using surface-modified fillers. Since the structure and/or thermal molecular motion of polymers at the filler/polymer interface is affected by the interactions with the fillers, it is believed that surface modification changes the properties of the BRL, resulting in an improvement in the tire’s performance. However, this is still hypothetical, because there is insufficient evidence and empirical data, e.g., on the influence of surface modification on the BRL. The relationship between the BRL and tire performance needs to be evaluated to develop guiding principles for improving tire performance. Although the number of reports on the general BRL framework is increasing, it is still unclear how the surface modification of fillers affects the structural and mechanical properties of BRLs. In this study, we have investigated the distribution of rubber polymer on model filler surfaces (carbon or silica) using neutron reflectometry (NR) at SOFIA reflectometer in J-PARC. The experimental results show that the heterogeneous distribution of rubber polymer near the carbon surface depending on the surface energy. Additionally, we investigated the distribution change depending on the kind of coupling agent at the silica surface. Materials and Life Science Experimental Facility (MLF) at J-PARC is a user facility providing the world highest class neutron and muon pulsed beam. As a neutron part of MLF [], we are serving 20 neutron instruments to user program, which are covering various type of measuring techniques, i.e., direct/indirect geometries and spin-echo spectrometers for inelastic and quasielastic neutron scattering, single-crystal, powder, engineering and high-pressure dedicated diffractometers, a total scattering instrument, reflectometers in horizontal and vertical geometries, a small and wide angle scattering instrument, an energy resolved imaging facility, beamlines for fundamental physics studies, and so on. Also, a polarized neutron dedicated chopper spectrometer is its commissioning phase and will be on line soon. These instruments are realizing research in wide range of fields, such as fundamental physics, solid state physics, biology, chemistry and industrial applications, which are carried out by users (we had 950 unique users visited MLF in 2017) and facility staff. We are also devoting some of efforts to promoting or to enhance scientific outcome. One of examples is a deuteration laboratory program which is under way with strong help of Australian friends. In this presentation, I will overview current status of our neutron source, neutron instruments at MLF with selected topics of recent scientific output from the facility. K. Nakajima et al., Quantum Beam Science 1, 9 (2017). The China Mianyang Research Reactor (CMRR) with the power of 20 MW is located in Mianyang city, Sichuan Province. The thermal and cold fluxes for neutron scattering experiments are 2.4×1014 n/cm2•s and 109 n/cm2•s, respectively. The reactor has run 120 days in 2016, and run more than 150 days in 2017. Now it has been included in the website: Neutronsources.org. Eight neuron scattering instruments have been operated normally from the middle of 2014. Four thermal neutron instruments were installed in the reactor hall: a high resolution neutron diffractometer (HRND), a residual stress neutron diffractometer (RSND), a thermal neutron radiography station (TNR) and a high pressure neutron diffractometer (HPDC). Four cold neutron instruments were installed in the guide hall: a small-angle neutron spectrometer (SANS), a time-of-flight and polarized neutron reflectometer (TPNR), a cold-neutron triple-axis spectrometer (CTAS) and a cold neutron radiography station (CNR). Intensive work has also been done for instrument improving during recent years. The texture measurement was realized on the RSND by utilizing the Kappa goniometer. The HPDC is has been upgraded with 6.7m focusing neutron guide to improve the flux, which has reached to 3 ×106n • cm-2 • s-1. The high pressure loading has realized maximum pressure 20GPa. The HRPD will be upgrade with high resolution and high intensity modes. SANS has changed the velocity selector with GE products and adjust the collimation system, thus the cold neutron flux at the sample position is 2×107 n•cm-2•s-1. The characteristics of the TPNR are the time-of-flight and polarization modes. Relative resolution of momentum transfer of the TPNR is ∆q/q=(0.5~5)% for q=(0.05~3.0) nm−1. The CTAS has an energy resolution of ∆E/E≤2% with a range of energy transformation of 0~10 meV. Based on the neutron scattering instruments at CMRR, some interesting research experiments have also been done. RSND provides a unique tool for accessing the internal stress distribution and deform mechanism inside components. Neutron powder diffraction pattern gives the degrees of structure distortion and changes of bond lengths between Co/Fe and O in Co0.708Fe0.292WO4, CoWO4 and FeWO4, which has been published on Nano Energy. The finding of the localized NH4+ and totally disordered H+ in the battery of (NH4)3Zr(H2/3PO4)3 has been published on 2018. Some results of soft matter using SANS has been published on Macromolecules and Adv. Mater. etc. Some magnetic film study by TPNR has been published on Sci. Report. and Phys. Rev. Appl. etc. The second phase for neutron instruments construction has been started from 2017. Three new instruments will be built within next 3-5 years, which are a polarized thermal neutron triple-axis spectrometer (TTAS), an ultra small-angle neutron spectrometer (USANS), and a neutron standard-test beam line (NSTB) for single crystal and texture measurement, respectively. More sample environment systems will be equipped for the present spectrometers, such as high/low temperature, high pressure, superconducting magnetic field, chemical loading (hydrogen/deuterium gas environment), and so on. Recently, we also get the funding for neutron spin echo spectrometer. The inelastic mode (LNRSE) and small angle mode (SESANS) are both under designed by split the C3 cold neutron guide using bend guide. The relative polarized 3He signal was firstly observed by FID NMR in May 4 2018. So it could be expected that more contributions for the neutron scattering will be made by our institute in China. The National synchrotron radiation research centre (NSRRC) in Taiwan has a group of scientists stationed at the Australian Centre for Neutron Scattering (ACNS), ANSTO, Australia. Three Instrument Scientists were hired to operate neutron scattering instruments and to serve users; Chun-Min Wu works on Small angle neutron scattering instruments, Chin-wei Wang is a Powder diffractometer scientist and Shinichiro Yano works on the cold triple axis spectrometer SIKA. In addition, one staff member is a software engineer. Under this arrangement, we have built the cold triple axis spectrometer SIKA in the OPAL reactor beam hall at ANSTO. SIKA was designed to study dynamics in magnetic materials in the energy range of meV and below with high resolution. The Taiwan investment adds particular value to the area of materials science whereby Taiwan and Australia both benefit. Following 10 years of construction, SIKA has been in the user program since 2015 July with the number of scientific publications growing steadily since then. Taiwanese users now occupy about 20 percent of international proposals submitted to ACNS in the 2018-2 proposal round whilst the Taiwanese neutron scattering community is also growing. We hope for continued good relations between NSRRC and ANSTO with a view to expanding our collaboration. We are currently in the process of hiring an additional instrument scientist who would be working on a reflectometer at ACNS. In this talk, we will present scientific outcomes from the NSRRC neutron group and updates from SIKA. In meso membrane protein crystallization within a lipidic mesophase has revolutionized the structural biology of integral membrane proteins (IMPs). High-resolution structures of these proteins are crucial to understanding fundamental cellular processes at a molecular level, and can lead to new and improved treatments for a wide range of diseases via rational drug design. However, overall success rates of the promising in meso crystallization technique remain low because of a fundamental lack of understanding about factors that promote crystal growth. In particular, to date, two decades from invention of the method, the protein-eye-view of the in meso crystallization mechanism had not been solved. We have investigated this for the first time using small-angle neutron scattering (SANS). Contrast-matching between the scattering of the lipid membrane formed by MO and the aqueous solution was used to isolate and track the scattering of single-transmembrane peptides during the growth of protein crystals in meso. No peptide enrichment was observed at the flat points of the diamond cubic QIID phase of MO in contrast to suggestions in several modeling studies. During in meso crystallization of the DAP12 peptide a decrease in form factor and a transient fluid lamellar Lα phase could be observed providing direct evidence for the proposed crystallization mechanism. Synthesis of fully deuterated MO was required for this purpose and scattering of this new material in various solvents and under a range of conditions will be described, specifically regarding the effect of the relative scattering length densities (SLD) of the headgroup, acyl chain and solvent, which can advance the use of neutron scattering with other self-assembly materials. The internal structure of a thermoresponsive poly(N-isopropylacrylamide) (PNIPAM) brush coating has been investigated via neutron reflectometry and small angle neutron scattering (SANS). PNIPAM is a thermoresponsive polymer with an entropically driven lower critical solution temperature (LCST). Below the LCST, the polymer will hydrogen bond with H2O, solubilising the chains. Above the LCST, the entropic penalty from solubilising the hydrophobic regions of the polymer becomes too great, and PNIPAM becomes insoluble. When tethered to a surface in the polymer brush regime, the brush layer is swollen at low temperatures and collapsed above the LCST. Furthermore, this abrupt LCST broadens into a temperature transition range spanning 10-20 °C. We have examined the influence of molecular weight, ionic strength and salt identity on the temperature induced swelling/collapse transition of PNIPAM brushes using ellipsometry, QCM-D, AFM, contact angle measurements and DLS. [1-2] These techniques provided a detailed understanding of bulk and surface properties of the PNIPAM systems investigated. The use of neutrons to interrogate these systems, however, has enabled subtle variation in the brush volume fraction profile normal to the substrate to be elucidated (Fig. 1). This highlights any variations related to surface curvature, brush thickness, surface confinement, ionic strength and salt identity. T. J. Murdoch, B. A. Humphreys, et. al., Macromolecules 2016, 49, 6050-6060. (a) B. A. Humphreys, et al., JCIS 2018, 516, 153-161; (b) B. A. Humphreys, et. al., PCCP 2016, 18, 6037-6046; (c) T. J. Murdoch, B. A. Humphreys, et. al., JCIS 2018, 526, 429-450. There is growing concern about plastic waste in the environment, and its impact on biological organisms. While bulk plastics are thought to be non-toxic, when the plastics break down to a sub-micron length scale (i.e. nanoplastics), they obtain extra mobility inside living things, and may cause various adverse effects [1,2]. This, coupled with a lack of knowledge surrounding the dangers from different types of plastics, prevents well-designed responses to the problem. Hypothetically, the potential adverse effects are caused by protein denaturation, oxidative stress and/or cellular membrane damage. However, the inherent complexity of biological systems makes it challenging to gain a mechanistic understanding. Adding complexity to this problem, the potential adverse effects are highly dependent on the nature of nanoparticles (NPs) – the contributing factors could include elemental composition, chemistry of the plastic surface, and/or size of the plastic particle [3,2,4]. When in biological systems, nanoplastics are surrounded by various types of proteins5. The structure of proteins surrounding nanoplastics are important parameters to understand the interaction of nanoplastic/protein composite. We carried out light scattering and small angle neutron scattering (SANS) experiments to explore the structure of the protein corona on monodisperse polystyrene spheres using a model protein human serum albumin (HSA). The geometry of the PS/HSA complex was investigated with a contrast matching method. The transition from a “soft” to a “hard” interaction between the nanoparticle and the protein was observed when pH is lowered from 7.4, and the implications of this on nanoplastic toxicity is discussed. Sharma, S.; Chatterjee, S. Environmental Science and Pollution Research 2017, 24, 21530-21547. Lee, K.-W.; Shim, W. J.; Kwon, O. Y.; Kang, J.-H. Environmental science & technology 2013, 47, 11278-11283. Mattsson, K.; Johnson, E. V.; Malmendal, A.; Linse, S.; Hansson, L.-A. ; Cedervall, T. Scientific Reports 2017, 7, 11452. Cui, R.; Kim, S. W.; An, Y.-J. Scientific reports 2017, 7, 12095. Tenzer, S.; Docter, D.; Kuharev, J.; Musyanovych, A.; Fetz, V.; Hecht, R.; Schlenk, F.; Fischer, D.; Kiouptsi, K.; Reinhardt, C. Nature nanotechnology 2013, 8, 772. Layers of densely-tethered polymers (polymer brushes) are of interest due to their potential applications as nano-actuators, biocompatible coatings, and switchable lubricating or antifouling surfaces. These applicable properties are dependant on the structure of the polymer interface, so it is important that the structural effects of common compounds and relevant environmental variables be understood. Neutron Reflectometry (NR) is the only technique capable of providing detailed structural resolution of solvated multi-component polymer brush systems due to its penetrating power and the possibility of isotopic substitution. Here we present a Neutron Reflectometry study on the effects of surface-active molecules (surfactants) on two neutral polymer brushes, poly(ethylene oxide) (PEO) and Poly(N-isopropylacrylamide) (PNIPAM), focusing on small, single tail surfactants. PEO is a widely used biocompatible polymer with a range of medical and commercial applications, whilst PNIPAM is a well known thermoresponsive polymer, undergoing a swollen to collapsed transition over its critical solution temperature (CST) of 32˚C. We show that these two polymers exhibit similar yet distinct interactions with surfactants, with the observed differences having implications for the mechanism of brush-surfactant interaction. The presence of surfactants was found to raise the CST of PNIPAM; we show that this effect is dependent strongly on surfactant identity and concentration. As part of this work we have developed new modelling techniques for the analysis of NR data from polymer brush interfaces. These advancements will be explained in the context of the data at hand, and their applicability to other soft diffuse interfaces will be briefly discussed. Suspensions of solid lipid nanoparticles (SLNs) stabilized with emulsifiers have been extensively investigated as drug carriers since the 1990s, although details of their ultrastructure are poorly defined. Previously, our group reported a novel microwave-assisted microemulsion-based technique to prepare SLNs. Ultrastructure generally relates to interior of the particle and can relate to internal partitioning through, for example, a core-shell structure. It can also relate to the formulation itself, including the particle itself, but can also include structures such as micelles, which may be simultaneously present. Our previous investigations revealed that SLNs were prepared by the novel microemulsion technique have size of 200-300 nm. Preliminary multi-angle SLS/DLS studies indicated core-shell type of SLNs. To understand the detailed ultrastructure of these SLNs, ultra-small angle neutron scattering (USANS) and small angle neutron scattering (SANS) experiments were conducted on suspensions of hydrogenated stearic acid SLNs stabilized with hydrogenated Tween 20 surfactant in D2O. Together, SANS and USANS gave a combined Q range of 4.7 × 10^-5 to 6 × 10^-1 Å^−1 (corresponding to a size range of ~ 1 nm - 15 µm). This extended Q range allows a comprehensive understanding of the hierarchical structure of SLNs. The SANS/USANS data are consistent with the multi-length scale structure of SLNs having polydispersed large particles at the microscale level, intermediate between spheres to rod, with roughened surfaces. At the nanoscale level, the results are consistent with the SLNs solution having an ellipsoidal shape intermediate between spheres and rods, with a crossover from mass fractals to surface fractals. The elucidation of this structure is particularly important given that the structure influences the stability and drug release properties of the nanoparticles. These results will assist in the development of systems with desired shape and properties. Neutron reflectometry is a powerful technique for studying the structure of surfaces and interfaces at the nanometer. The useful properties of neutrons allows for isotopic contrast variation in multi-component systems and being able to investigate phenomena under a wide variety of sample environments. At the OPAL Research Reactor there is currently one operating neutron reflectometer – PLATYPUS, however demand is sufficient that a second is needed. In September 2015, an agreement was signed between HZB and ANSTO to transfer the V18 ‘BioRef’ time-of-flight neutron reflectometer , previously situated at the 10 MW BER-II Research Reactor, to the OPAL Research Reactor. During 2016, a joint team of ANSTO and HZB personnel carefully disassembled BioRef and packed it into shipping containers for transport to ANSTO. BioRef arrived at ANSTO in early 2017 and is known as SPATZ (German for Sparrow) and will be the 15th neutron-scattering instrument at OPAL. SPATZ has a vertical sample geometry, which complements PLATYPUS with its horizontal sample geometry. The vertical sample geometry will allow for use of sample environments which cannot be currently used on PLATYPUS due to geometry constraints and allows for wide-angle diffraction from multilayers and lamellar stacks. SPATZ will also be equipped for simultaneous infra-red spectroscopy and reflectometry experiments. The instrument views the OPAL cold neutron source (CNS) by taking the end position of the CG2B guide, which has recently been installed. SPATZ is scheduled to start hot commissioning in October/November 2018 and start user experiments in early 2019. This presentation will provide an overview of the project, its current status, and future direction. Feedback from the neutron user community is encouraged. In the past 2 years since the 2016 AANSS symposium, the sample environment group of the Australian Centre for Neutron Scattering (ACNS) has continued to facilitate neutron experiments and expand sample environment capability. This report will present the current sample environment and laboratory facilities and recent developments. We have made progress in light irradiation and spectroscopy developments; on a new temperature controlled multi-sample changer with tumbling capability; on a rotational PE Cell; and on new sample probes made from composite materials. Other improvements include new high pressure couplings for helium compressors and modifications to a dilution insert to allow larger samples and use in other cryostats extending the capability. Ongoing major projects are a new superconducting split-coil magnet dedicated to SANS and TOF-PAS, two new cryostats (1.5 K to 800 K temperature range) with the aim of halving the system and sample cooling time and a new dilution fridge that will allow top-loading of samples and the ability to take much larger samples than the existing dilution insert. There have also been staffing changes with previous Sample Environment Group Leader, Paolo Imperia moving into the Operations Manager position. The new group leader, Rachel White, was recently appointed. Our Laboratory Manager, Deborah Wakeham, joined us in July 2017. Rheo-SANS (rheology and small angle neutron diffraction) is now a well-established technique to probe the shape and size of particles under different shear and temperature regimes . Recent work on WOMBAT , the high intensity neutron diffraction instrument at the Australian Centre for Neutron Scattering, has successfully combined rheology and neutron diffraction. This was used to follow the crystalline phase transformations in a model (deuterated) triglyceride. The initial impetus for this work was part of a forensic investigation  linking the crystallisation of triglycerides under high shear rates that are encountered in motor vehicle accidents. However now the technique has been demonstrated it may be of interest to investigate crystallization due to shear in other organic systems. Figure 1 - Diffraction data collected from the shear cell during cooling and shearing at 1000 s-1, colours give the intensity of the diffraction pattern (left axis) and the black squares chart the measured viscosity (right axis). This demonstrates the ability to track crystallisation in situ under high shear rates. The high neutron flux and detector efficiency available at WOMBAT is instrumental in allowing diffraction patterns to be collected from the small sample volumes available in the Couette cell geometry. The Couette cell used has a sample gap of 1mm and was mounted tangentially to the neutron beam. The shear rate applied to the sample can be varied over a range of 10-2500 s-1 and the temperature can be controlled using an external water jacket from between -10 and 80 ⁰C. We invite other researchers who are interested in this capacity to contact us about possible experiments. Studer, A.J., M.E. Hagen, and T.J. Noakes, Wombat: The high-intensity powder diffractometer at the OPAL reactor. Physica B: Condensed Matter, 2006. 385–386, Part 2(0): p. 1013-1015. The Australian National Deuteration Facility (NDF) continues to develop new capabilities in molecular deuteration. The tailoring of deuteration approach to solve specific contrast problems has greatly increased the range of systems that can be investigated and recent capability development and new applications will be described. The common problem of how to obtain good contrast during SANS of membrane proteins solubilised in detergent micelles has been solved by specific deuteration of detergent head groups and hydrophobic tails to different levels to contrast match at 100% D20 buffer. Likewise, in investigating the location of a purely hydrophobic transmembrane peptide in bicontinuous cubic phase liquid crystals suitable for drug delivery, a mixture of deuterated and hydrogenated phytanoyl monoethanolamide was used to perfectly contrast match out either gyroid or diamond phase lipids to pinpoint the peptides location. In Soft Matter, investigation of structure of the ligands in the shell layer of self-assembled monolayer-protected nanoparticles has been made possible by use of various combinations of immiscible deuterated or hydrogenated Phenylethanethiol (PET) and Dodecanethiol (DDT) and MONSA modelling of SANS data showed the janus and belt like distribution of the ligands on the surface and the effects of nanoparticle core size and ligand ratio on the patterning. Other case studies will include use of deuterated ionic liquids and new previously unavailable deuterated molecules will be highlighted. This work was supported by the National Collaborative Research Infrastructure Strategy. The ECHIDNA high-resolution neutron powder diffractometer at the 20MW OPAL research reactor produces high-quality data for a broad spectrum of crystal and magnetic structural studies. The poster presents an overview of the current status of the hardware, latest developments in data reduction software, statistics of the instrument usage and user programme, and instrument limitations.